St Ives is one of Cornwall’s most famous tourist venues with its fishing port, beaches and a warm climate. It has a long association with well-known British artists from Turner through to Ben Nicholson, Patrick Heron and Terry Frost. It was in 1939 that Nicholson returned to St Ives with Barbara Hepworth and they established West Cornwall as an outpost for abstract avant-garde, art firmly linked to the interpretation of the local landscape. The town is now the home of Tate St Ives part of the National Tate collections. Part of the Tate collections is the Barbara Hepworth Museum and Sculpture garden – a monument to one of Britain’s greatest sculptors. Hepworth’s work, displays an air of life and vitality amongst the unique and fitting environment of the sub-tropical house-garden attached to her Trewlyn studios. Hepworth trained at Leeds School of Art before moving onto the Royal College of Art in London, where she befriended the young Henry Moore (another great twentieth century sculptor). Her work always had close link with nature but was entirely abstract by the 1930s. The smooth, elegant lines of her work also remind many of the feminine form. In 1931 she pioneered the use of the ‘hole’ in her sculpture ‘Pierced Form.’ Over the years she developed this with great subtlety, making play with the relationship between the outside and inside of a figure and it became a distinctive trademark of her work. From 1925 to 1931 Hepworth was married to the sculptor John Skeaping (1901-80). She married Ben Nicholson in 1932, and through her new husband she became aware of contemporary European developments. Together they joined Abstraction-Création in 1933 and Unit One in same year. 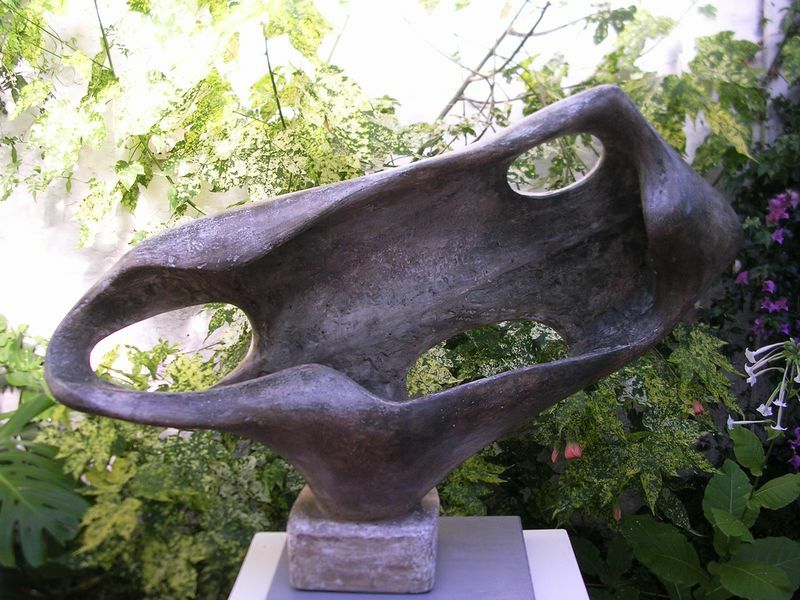 During the 1930s Hepworth, Nicholson, and her good college friend Henry Moore worked in close harmony and became recognised as the nucleus of the abstract movement in England. Hepworth moved to Cornwall in 1939 and remained in the small fishing town of St. Ives for the rest of her life. By the 1950s she was an internationally famous sculptor receiving honours and prestigious public commissions, among them the memorial to Dag Hammerskjold – ‘Single Form’ – at the United Nations in New York (1963). In 1965 she was made a Dame of the Order of the British Empire. Tragically she died in a fire at her studio in 1975. In her will she dictated that her Trewlyn studios and the adjacent garden should be left open as an exhibition of her work, even leaving instructions of where the art should be placed. Her love of nature makes the leafy, quiet and tranquil garden a perfect place to display her works to the world. 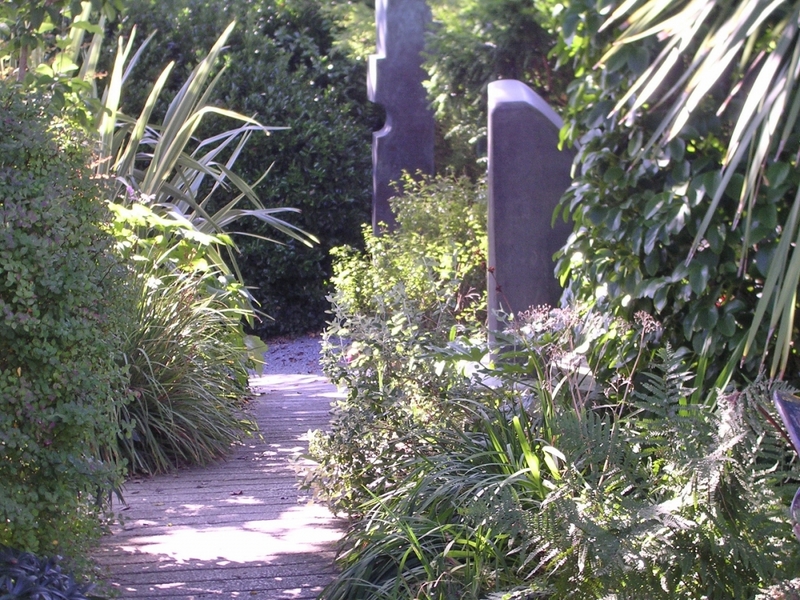 Barbara Hepworth’s studio and garden have been run by the Tate since 1980, and are now an integral part of Tate St Ives. The works on display in the Museum and garden are almost all from the period of her life that she lived in St. Ives. Visitors can look at twenty-two examples of her sculptures and paintings in the museum and twenty-one sculptures set in the garden to her design. Almost all pieces were presented by the executors of the artist’s estate or lent by the Trustees of the Barbara Hepworth Estate. Cornwall provided particular inspiration particularly by its nature and by the forms, shapes, sounds and movements Hepworth experienced on frequent coastal walks in the area. The garden attached to Trewlyn studios is unremarkable in size, similar to gardens owned by the typical English homeowner. Like many of the gardens in St Ives, it has a small greenhouse, a pond, winding stone paths and a lawn. Trees and shrubs form the borders and protect the inhabitants from prying neighbourly eyes. Hepworth’s garden however is untypical in the bright sub-tropical plants that thrive here in the warm coastal conditions. Her garden is secret, intimate and evergreen with dashes of the exotic splashed in odd places as if by the flick of an artist’s brush. Visitors can wander through the paths and discover dozens of examples of her work in the trees, greenhouse, lawns and even the water features. Her smooth, flowing forms fit perfectly in a floral environment looking and feeling as natural as their surroundings. Her workshop is left cluttered and untidy, full of unfinished sculptures. It is as if the artist has just popped out for a quiet cup of tea or an afternoon walk. If it is possible anywhere in the world it is from here that you might be able to catch a small glimpse of how the mind of this creative and visionary woman worked. This garden is an example of how a relatively ordinary urban space can be transformed into something to be appreciated and enjoyed. Under 18s and over 60s go free. Shop: A small amount of Hepworth-related products are sold at the ticket office. Parking: Public parking must be used. Car parks can be found very near the Tate St. Ives, only a short walk from the Hepworth Garden. Follow signs for Tate St. Ives. Seats and benches: A sufficient number of seats and benches are provided. Average visitor duration: Average visitors will stay for 20 minutes, art lovers longer. Accessibility: Narrow paths and steps from reception and into the garden make wheelchair and PMV access impossible. A free list of sculptures can be provided. Information on Barbara Hepworth and artefacts from her lifetime can be found in a presentation by the entrance. By Road: Follow the signs for St. Ives and the St. Ives Tate. Be aware that car parks during the summer months will be busy. By Rail: There is a regular train service from London Paddington. Change at St Erth for the branch line to St Ives.